Neil loves to tell stories with his marketing. He is very good at it. I find all of his information valuable and interesting. I have always believed that being a good story teller is a great sales tool. Learn how to master this technique, and you will certainly increase your sales and profit. That’s why people love to watch movies, read books, and binge-watch television shows. You’ll be able to boost your sales if you can get customers to connect with your stories. But luckily for you, I’m very familiar with storytelling. I’ll share with you some of my storytelling secrets that you can implement in your marketing campaigns to squeeze revenue from your customers. 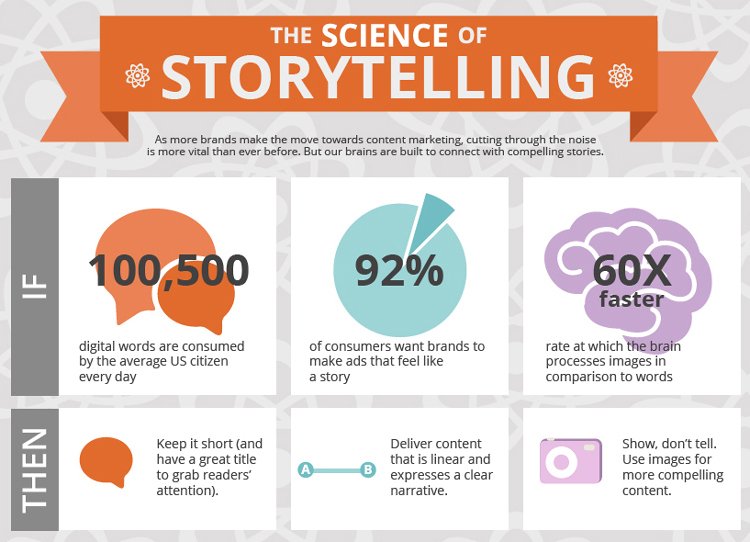 Here’s how you can master the art of storytelling. First, recognize to whom you’re telling the story. Make sure it’s appropriate for that audience. Let’s use an analogy before we relate it to your business. A story you might tell to your poker buddies during a card night while having a beer may not be something you’d tell your in-laws during a Thanksgiving dinner. For the most part, I’d recommend keeping your stories suitable to all ages. I practice what I preach. If you read my blogs, you typically won’t see any vulgarity or cuss words. If you’re posting it on social media, your audience may vary depending on the platform. Let’s say you identify your target audience as baby boomers. Based on the graph above, it wouldn’t be smart to tell that story on Instagram, Snapchat, or Twitter because there isn’t an active presence of your audience. Once you figure out the target, you’ll be able to use an appropriate tone to tell the story and release it on the right platforms as well. You might be able to tell the best story in the world, but that means nothing if you don’t have a goal for it. That’s the only way you’re going to get customers to convert and increase your sales. Someone may read this story and think something similar could happen to their home if they live in an area below sea level that’s susceptible to a natural disaster. While fear is definitely a powerful emotion, it’s not the only way to get a response from your audience. On their website, they include a biography about their company’s founder, Blake Mycoskie. It’s a simple plan to help those less fortunate and a great business model for a for-profit organization. Remember, we’re trying to tell actionable stories. If your story is super unique and isn’t relatable to a wide audience, you’ll need to find a way to tweak it. That’s something people can relate to. Tony says he was in that position too at one point in his life, but there’s a way out. That’s the actionable response he’s trying to get from you by telling you a story you can relate to. People can’t relate to that lifestyle, but they can connect with financial struggles. You’ll also get more engagement with your customers through blogging. It’s not like they’re giving money to some faceless and nameless brand. I could talk all day about why your business needs to have a blog, but we’ll save that conversation for another time. Right now, it’s just the most logical place for you to share your content that’s a story. Your customers don’t have enough hours in the day to devote 40 minutes to your story. If you do this, your story won’t get read, which is counterproductive and a waste of your time. Make sure you have a headline that grabs the reader’s attention. You could have an amazing story, but it’s not worth anything if you can’t get people to click on it. That’s why I use my YouTube channel to tell stories to my audience. If you don’t have a YouTube channel, you need to make one right away. This way you won’t have to come up with fresh topics all the time. People aren’t stupid (for the most part). They realize that anything you tell them will have some sort of bias toward your brand: you won’t publish any stories that discourage people from buying your products. That’s why you need to let customers share their stories on your website. Feel free to take a similar approach and designate a page on your website that’s strictly for user-generated content. But if you follow the tips I’ve outlined above, you can master this art and begin to see the positive impact it has on your sales. Make sure it’s appropriate and relatable to the customer.